Governor Amaechi has finally released a statement on the bloody fight that took place between FSARS officers guarding him and Governor Nyesom Wike’s security officials in Rivers State yesterday. “In a blatant show of naked raw power, Minister of Transportation, Rt. Hon. Chibuike Rotimi Amaechi this afternoon narrowly escaped being shot by security men attached to the Governor of Rivers State, Nyesom Wike. His car wasn’t that lucky though. The car was vandalized with a broken side mirror. Accompanied by cars of many of his supporters, the Minister’s black jeep was intercepted and blocked at the junction by the security Motorcycle Outrider attached to Wike after two cars had passed through. One of the two cars had security men assigned to protect the minister in Port Harcourt. Suddenly, gun-totting security men attached to Wike’s convoy, surrounded the Minister’s car, threatening to shoot him. They hit the car, tried to smash the windscreens, back and side windows and broke a side mirror. All through this attack, Amaechi remained calm, inside the fortified Jeep. While the attack occurred, Wike remained inside his vehicle. 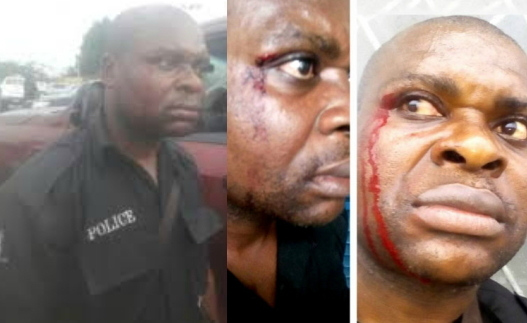 “The Rivers governor and his troops physically assaulted by slapping and bruising the policemen, especially Inspector Johnson Imonikhe, Sgt. Eteng Ewelu and Sgt. Princewill Ubaji, attached to the transportation minister and the governor made away with the AK-47 rifle of Sgt. Princewill Ubaji, one of the policemen attached to the transportation minister. 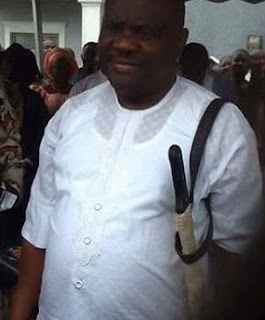 “The AK-47 rifle was forcibly taken away personally by Governor Wike, who was accompanied by his CSO. The policeman with blood on his face, Sgt. Eteng Ewelu, was hit with an iron by Wosu (Wike’s CSO), in the presence of the Rivers State governor.